In a blender, combine all of the ingredients except the water. Slowly add the water in, starting out with a 1/2c and adding more depending on the thickness desired, up to 3/4of a cup. Delicious served over buckwheat soba, or with fresh shredded cabbage to make zesty coleslaw. **Sriracha hot chili sauce can be found in most specialty markets, Asian markets, and even in some health food stores. 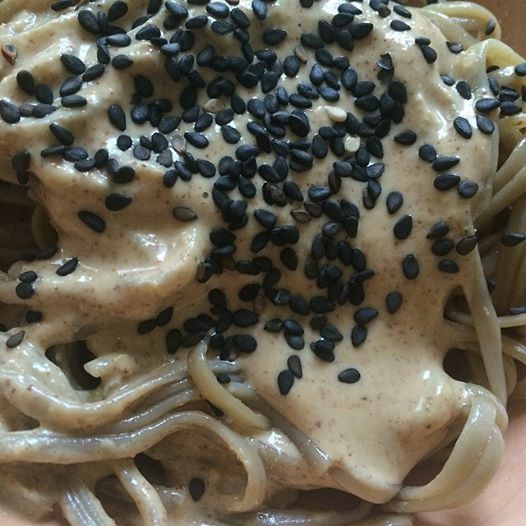 This entry was posted in almost raw, buckwheat soba, mains, pasta, RAW, spreads and sauces, Vegan and tagged almost raw, animal free, antioxidants, comfort food, crossfit fuel, dairy free, eat local, fricken delicious, fricken yum, gluten free, save the planet, vegan protein, vegan protein smoothie, yoga fuel. Bookmark the permalink.